Operations Support Unit is a group of volunteers that support the rest of Snohomish county Volunteer Search and Rescue. 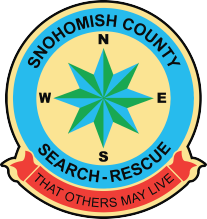 Operations Support Unit is part of the Snohomish County Volunteer Search and Rescue non-profit that serves all of Snohomish County and assists surrounding counties when needed. Our mission is to help bring lost or missing persons home, as well as assist the Snohomish County Sheriff in other needed operations by facilitating the command, paperwork, and communications as well as personnel support needed for successful missions by other specialized units. Our volunteers spend countless hours on an average of 80 missions per year. Missions include: lost hikers, children, hunters, climbers, Alzheimer’s victims, missing aircraft, river and lake rescues, and assisting other agencies throughout Snohomish County and the Puget Sound area. Snohomish county Volunteer Search and Rescue never charges for its rescue services. Our operation is mainly funded by private donations. Operations Support Unit provides command, coordination, communications, and hospitality assistance to Snohomish County Volunteer Search and Rescue, the Snohomish County Sheriff’s Office, and the Snohomish Country Department of Emergency Management when those agencies request us. We help with search and rescue work, but are also called on to assist with natural disaster management. We are always on call 24 hours a day, 365 days a year. COMMAND: Operations Support Unit (OSU) Command Operations facilitate Snohomish County Volunteer Search and Rescue (SCVSAR) operations by tracking personnel, equipment, and resources. Command is also responsible for creating the Snohomish County Sheriff’s documentation for the every mission. Command vehicle staff have no small task and create the same level of professional documentation for every call we take from a broken ankle to a missing child. COMMUNICATIONS: Our communications ensure that missions go smoothly and safely. Without proper communications between the Sheriff, SNOPAC 911, ground and specialty teams, missions wouldn’t run safely or efficiently. We maintain a dedicated network of VHF radio repeaters to cover back country areas that are generally beyond the reach of cell phones and even the County’s first responder radio network. Our vehicles are equipped with VHF and 800MHz radios to communicate not only with ground teams but with Snohomish County Sheriff, fire, 911 dispatch, US Forest Service and aircraft from Snohomish County, other counties, Washington State, the Navy and Coast Guard to make sure all parties can coordinate their efforts. MAPPING: Since many of our operations are in dense forests and not on trails, it is imperative that all teams know where to be and what obstacles they face to remain safe. Since we often use the Helicopter Rescue Team (HRT) during missions and receive coordinates from cellular or satellite providers, we also need to translate coordinates into Lat/Lon coordinates used by aircraft and to the USNG coordinates the ground teams use. The mission maps are constantly updated with the latest clues as the search mission progresses to provide the planner and incident commander the best available information to direct search efforts. The OSU board is composed of elected representatives from within the membership, our elections are held yearly. You may contact any of us via e-mail by clicking on our names (below). For more information regarding the Operations Support Unit, please contact Tim Dehnhoff (the OSU President) by e-mail or by phone at 425.870.1724. Tim started with SCVSAR in 1996, joining the Marysville Unit. In 1999, he was elected Marysville Unit President and served in that capacity until 2003. In 2002, he was one of the founding members of the Operations Support Unit as has served as its president to date. Tim is a frequent mission responder, going on 18 years now, logging one of the highest volunteer hour counts on missions for all of SCVSAR throughout the organization’s history. Heidi serves as Vice President of the Operations Support Unit, a Unit Team Leader, and a Documents Expert. Heidi is a frequent mission responder, logging one of the highest volunteer hour counts on missions for all of SCVSAR within the last few years. Heidi and her husband, John, became involved with Search & Rescue after their son and two of his friends were rescued from a 6,300-foot perch on Three Fingers Mountain in August 2008. In 2012, she was awarded OSU’s highest award, The President’s Award, the description reading: “There needed most, delivering more than expected, helpful to all.” At the recent land slide in Oso, Washington Heidi was on station for 27 days following that tragedy. Unit, she responds to missions as Command Staff in support of the Incident Commander, primarily in documentation but is able to do Communications as well. Janice has also supported the Unit in fundraising events with duties that include radio communications and documentation for the event. Debra Draper currently serves as Treasurer and assists in running the Food Van for OSU. Debra volunteered for 21 days during the 2014 Oso Mudslide that took 43 lives cooking and serving home cooked meals. The minute she stepped into the Food Van she knew exactly this is where she was meant to be and joined SCVSAR OSU. Debra is a frequent mission responder, logging one of the highest within OSU. The Operations Support Unit meets from 7:00pm until 9:00pm on the fourth Wednesday of every month at our base of operations, Taylor’s Landing. Please contact us if you’d like to attend or you are interested in joining OSU. Plan ahead for any emergency! Regardless of whether your backcountry adventure is short or long in duration, it’s essential to always be prepared. You never know when the unexpected might become a reality. Here are the Ten Essentials every backcountry traveler should carry. Since calls made to 911 from remote areas are often hard to communicate, we recommend that you sign up for Smart911. Smart911 is a service that 911 (SNOPAC) uses to give more detailed information. Often when we arrive on scene for an injured hiker, we know very little about them. The more information 911 has, the better prepared we are. If we need additional resources sent up to your location on a trail for medical issues that you may have takes time. Please create a Smart911 profile, locating you having more information such as your car make and model, knowing if you have a condition like diabetes can drastically reduce our time to find you or change the way rescue you. Sign up for Smart911 today! REMINDER: Most of our missions are in wilderness environments. If you do get cell coverage, it’s usually not reliable. If you can, bring a satellite communicator, personal locator beacon (PLB), or Ham radio with you. If you can’t bring any of the above alternatives, make sure you’ve left a hiking plan with a responsible person (that is not going hiking with you). If you do go out with only a cellular phone, try calling 911. If that doesn’t work text 911 and a friend. Often times text messages will be sent when your phone gets signal, and short text messages do not need long once it has a signal. 911 (SNOPAC) is currently testing 911 text to dispatcher and it may not work. Texting the person that you left your hiking plan with might save your life. If you get a hold of 911 please turn your phones GPS on. This helps your phone get a more precise location, and you can turn it off as soon as it shows your location accurately, or if your dispatcher tells you to. Don’t let it drain your battery, but let it reduce our search area. 911 working with the US Air Force Rescue Command, can remotely locate your phone in an emergency. The hiking plan helps them to determine if you are late, strict rules apply for 911 being able to use the location ability, and they have to weigh if you are truly late or just avoiding things in-town. Without a hiking plan, or other reasonable information they may have to wait for 72 hours before locating your phone. If all else fails, know where the payphones, or landlines are on your way out. For example some campgrounds have payphones, and rangers at the ranger station can tell you where they are located along your route. Often times we get a call from one of the hiking party, who left to find a phone. Knowing where they are could save essential time and it could save lives!